Established in 1790 in Philadelphia. Transferred in part to Chester County Community Foundation in 1995. Franklin was a scientist, an inventor, and philosopher. Franklin was a musician, an economist, a postmaster, and editor. He was also a statesman, a printer, and a philanthropist. Yes, Benjamin Franklin was an all-around overachiever and legacy-leaver, and 200+ years later we remain the beneficiaries of his innovations and foresight. Indeed, Franklin’s legacy has taken many shapes: bifocals, the lightening rod, the odometer, and even swim-fins. We have Franklin to thank for America’s first fire company, insurance company, and public lending library. One of Franklin’s lesser known contributions is the legacy he left in June 1789, just one year before his death. Today it is the Chester County Community Foundation’s oldest endowment fund: the Benjamin Franklin Trust. 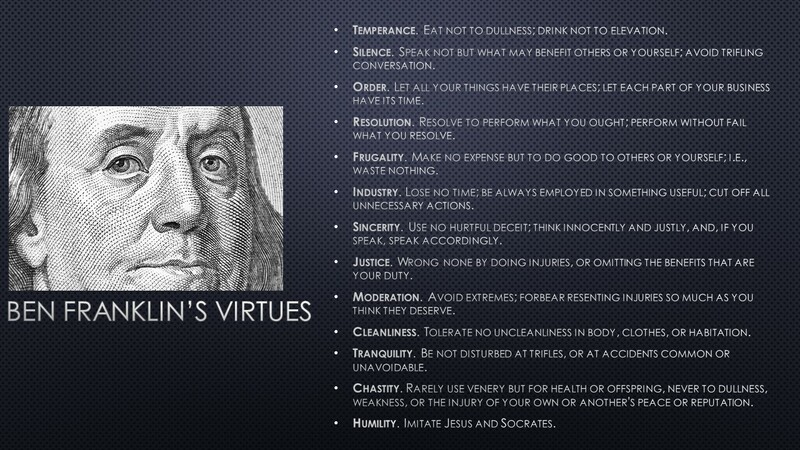 Ben Franklin’s Virtues as summarized by West Chester University Honors College students Tyshawn Hinton, Becca Shoemaker, Benjamin Popp, and Melissa Roth, February 2019. All meetings are confidential and informational in nature.